This is a rather crescent-shaped 4.4 oz, somewhat chaotic growth interference quartz cluster, 4” by 2.4” by 1.7” from Dal’negorsk, Russia. Some crystals are growth-interfered although she does have non-growth interference crystals as well! She sits on a flat base and some crystals have a thin plate of very fine druse on them, adding to the glitter. The energies radiate in a thousand directions and she is a perfect example of the beauty and evolution change can bring! Growth interference quartz is a transformation quartz. 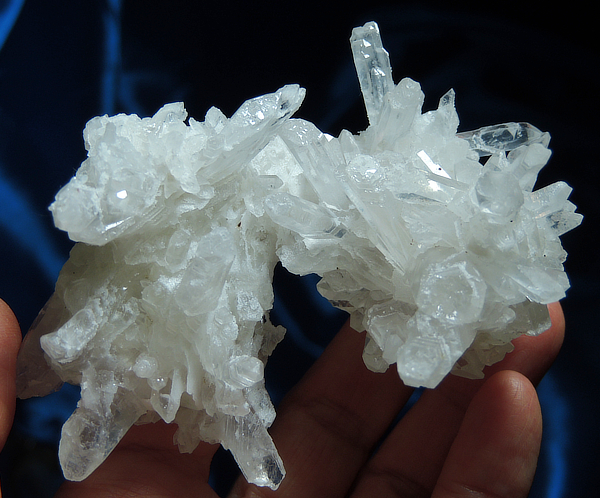 Layers of calcite shaped its beauty and then melted away through the eons. Deep within her soul, this Spirit knows about positive change and can assist you in dealing with and directing change in your own life. The Snow Queen’s aspect is one of introspection. To Native America, winter, the time of the snows, is a time for peace and introspection when the quiet is so deep that you suddenly become aware of your own heartbeat. It is a time of invention, according to a dear friend. When you can’t hunt and grow food, you have to sustain yourself throughout the long winter snows so that you are warm, well fed and occupied. You learn creativity, invention and expression, almost meditating as you work. And as spring approaches, you discover that you have developed a facet of yourself previously untapped and unexplored. The Snow Queen helps you adjust to this change which is often quite profound. You will never be the same again! Change is the only constant!